This convenient set of classroom manipulatives makes it easy to teach the program hands-on. Includes a variety of common manipulatives to match varying needs. 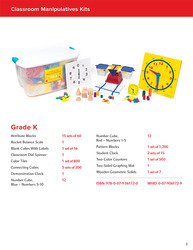 Helps students develop mathematical concepts through hands-on explorations. Allows for whole-group instruction by providing classroom quantities of materials.